Register your own team online today below in just two easy steps for the upcoming CAHL 2019 Summer Season. The Weeknight Divisions I-V will begin on Monday, May 27th, 2019. New teams are welcome to register as well. All you need are a few small groups of friends (teams have about 15 skaters and a goalie). We also have Free Agents to help you complete your team if you don't have enough players. New custom team uniforms can be provided for you as well at a CAHL team rate. 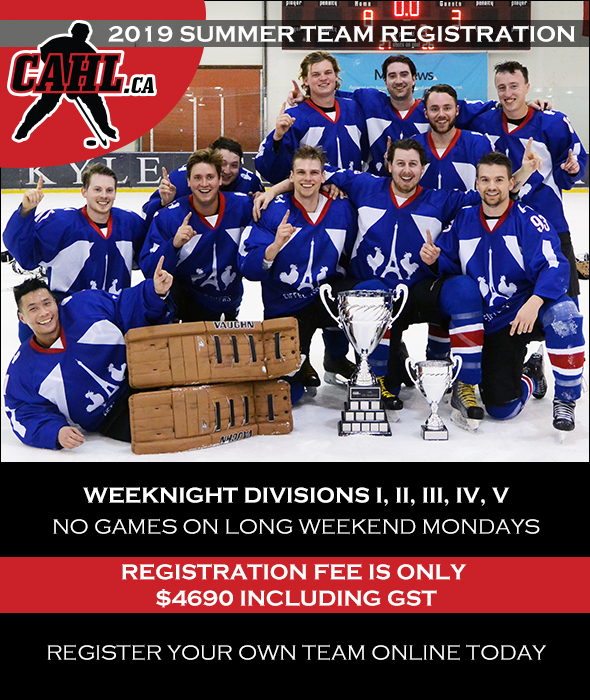 Email us at info@cahl.ca for more information or register your own team online today below in just two easy steps for the upcoming CAHL 2019 Summer Season. *There is no guarantee of any specific arenas or of the number of games at any specific arenas and arenas may vary among teams/divisions. **At the sole discretion of the CAHL, teams may also be moved up and/or down divisions to divisions which are not among the team's 1st or 2nd choices during division realignments at any point during the season (realignments would also result in schedule changes from the original schedule). Division realignments are based mostly on, however not limited to, team records, stats, etc. ***There is no guarantee of parity and how often a team may win or lose, or what scores a team may win or lose by. ****Skill levels are very difficult to describe without knowing the playing background of every player on every team and are only a very rough approximation and will vary. It works out to about only $294 per player for an average 16 player team (15 skaters and a goalie). The Total Team Registration Fee (total balance) Deadline is on Monday, May 20th, 2019. The teams must be paid in full by Monday, May 20th, 2019 in order to receive a team schedule. All of the Team Schedules will be posted after the Team Registration Fee (balance) Deadline (Monday, May 20th, 2019) on Friday, May 24th, 2019 when the final number of teams have been confirmed. You may use your credit card to make a Team Registration (Non-Refundable) Deposit Fee payment of $2000, a Team Registration (Non-Refundable) Balance Fee payment, a Team Registration (Non-Refundable) Total Fee payment, or a Team Registration (Non-Refundable) Partial Fee in the form below. *Teams are not guaranteed their 1st division choice and may be placed into their 2nd division choice, or the next closest available division, depending on the final number of registered teams per division. At the sole discretion of the CAHL, teams may also be moved up and/or down divisions to divisions which are not among the team's 1st or 2nd choices during division realignments at any point during the season (realignments would also result in schedule changes from the original schedule). Division realignments are based mostly on, however not limited to, team records, stats, etc. Please enter your Team Name, and your 1st and 2nd Division Choices* in your payment memo. If you need new custom team uniforms please email us at info@cahl.ca for a CAHL team rate. All teams should have two sets of matching colour team jerseys (a dark home set and a light away set) with numbers on the back. The matching colour team jerseys don't need to have logos. Matching colour team socks are not needed. 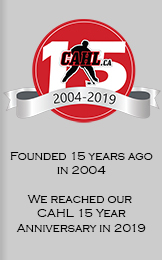 If you need additional players to complete your team please email us at info@cahl.ca and we will send you our current Free Agent list and have your contact info added to our website Free Agents section as well so that interested players may contact you directly to join your team. Please click here for our online CAHL Waiver form that all of your team's players will need to complete before they play. Please click here to review our Incident Communication Protocol. Please note that we reserve the right to add/remove/modify any rule at any time without prior notice as per Rule 5d. Rule 5d. (original rule) The Calgary Adult Hockey League reserves the right to add, remove, or modify any rule at any time without prior notice.